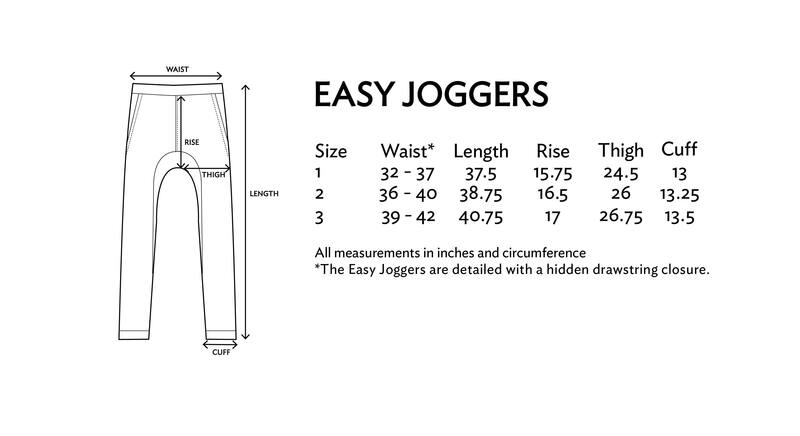 Introducing our latest men first style - the Easy Joggers. Handwoven in ikat, this comfy pair allows for ease of movement with its relaxed fit. This is our modern edit on a classic silhouette, pair them with your favourite shirt or dress them up with a collared top. We love them for their versatility. Featured here in the Daka print, reminiscent of the kind of rain that you stand under with open arms to enjoy. Detailed with a large box pocket in the back, it makes for an easy stowaway for all your essentials - wallet, phone, or even a notebook. Comes with side pockets, of course, and a hidden drawstring. The tapered fit and loose silhouette (inspired by the slouchiness of the Modern Monpe) make way for comfort in motion. Love Love Love. More men's please. Superb comfort, great fabric. Don't know if it will last they way I wear my pieces. I am rough and tough with my clothes.